The Rock is a large outcrop of primarily quartzite that rises over 360m above the Riverina plains south west of Wagga Wagga. It is the highest point in a small range that stands distinct from the flat farmland that surrounds it in all directions. Kengal, as it was known to the local Wiradjuri aboriginal tribe, is instantly recognisable from the east, shaped like a crouching lion. It played an important part in local initiation ceremonies. The Rock was originally named "Hanging Rock" by European settlers, due to a large boulder overhanging the east face. However, that fell in 1874, and the town which bears the same name was officially changed in 1918 to The Rock. As one of only a few areas of uncleared land in the area, it provides habitat for a number of threatened animal and plant species. Their protection is one of the reasons that it was declared a nature reserve, which has a higher priority on preservation than recreation. From Wagga Wagga, head south west on the Olympic Highway, and turn off to right to the town of The Rock after about 30km. Drive through the town, and turn left about 5km past the town to the parking area for the nature reserve. 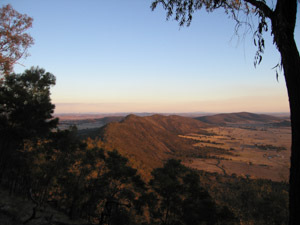 As the reserve is relatively small, the only marked trail is the Yerong Nature Trail which leads to the summit of The Rock. Off track walking is discouraged to avoid damage to threatened plant species. There is a small area of cliff known as the Towers, on which rock climbing is permitted. Climbing is not permitted anywhere else in the reserve. A relatively easy but steep climb to a regional landmark with good views of the surrounding countryside.